Well... What a demented Dragon. 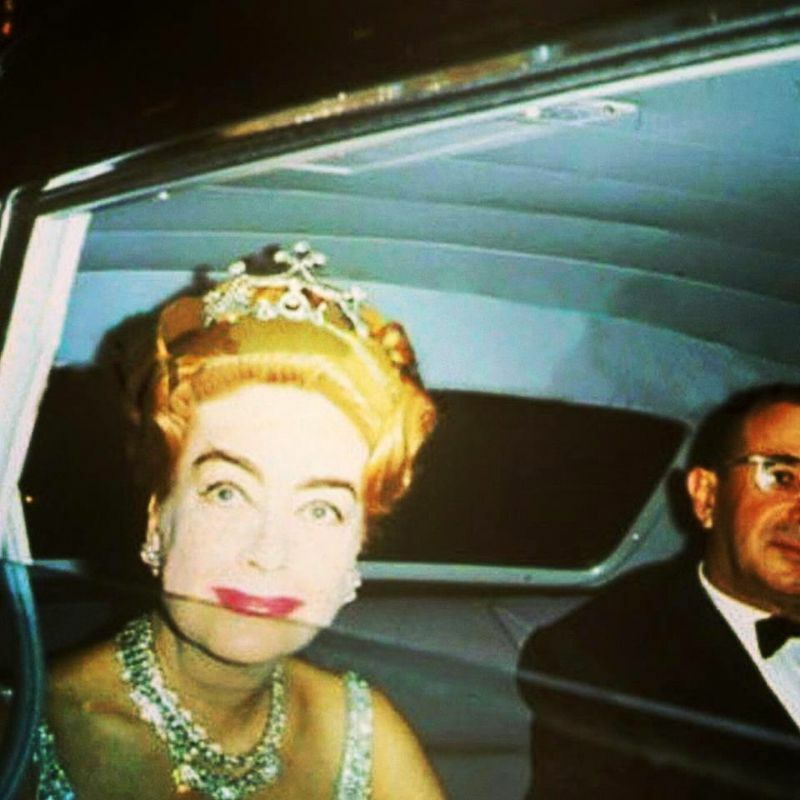 Could there be a more 1950s photograph? Next Wednesday, Bette will be 110. I know there is considerable debate surrounding Crawford's year of birth. I've read, on different websites, that cite 1904, 1905, and 1908 as likely approximations. Most websites side with 1904, although a 1910 census places her as five years old in April of that year. (She was born in March.) If this were true, this was place her being born in 1905. Crawford herself claimed 1908, which appears on her tombstone. Which year do you side with and why? Well that rules 1908 out completely. Obviously. From what I gather, there was speculation that Crawford's birth certificate couldn't be located for a number of years. This, coupled with Crawford's desire to be younger (perhaps by the pressure of Hollywood heavyweights), led to her decision to adopt 1908 as her year of birth. It seems her daughter Christina was told by her grandmother that 1904 was the correct year, although the facts from the 1910 census seem to lean towards 1905 as being more accurate. It's got to be either 1904 or 1905. One or the other. 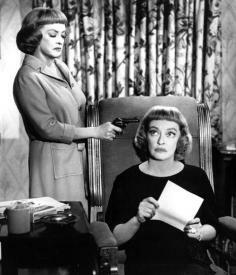 TCM recently had a little mini-thon of Bette Davis movies. I recorded a few of them to watch, some of them for the first time. Among those that got DVR requested was Dead Ringer. I've watched this movie before and I'm making my way back through it now. What's your thoughts? I like both of them... but in terms of reinventing one's career... Joan Crawford did that numerous times from the 20s into the 60s. DEAD RINGER and STRAIT-JACKET were shot and released at the same time, so they're often compared. While STRAIT-JACKET is better-remembered today because of its outrageousness (after all, Bette had already played twins before) DEAD RINGER was the much more polished picture, directed by her former-costar Paul Henreid and offering a gripping score by Andre Previn, although they're both seen as B-movies. The problem with STRAIT-JACKET is that it's soooo tackily-produced and sloppy (even by William Castle standards) that its potential is squandered, even though Joan is histrionically great in it... That said, don't forget to freeze frame the fatal stuffed-dog attack upon Peter Lawford in DEAD RINGER. I expected more from Dead Ringer when I first saw it recently. Strait-jacket is a treat from start to finish, in multiple viewings. By my standards (and most others, I suppose), Dead Ringer would be more of a mainstream production than Strait-Jacket. I actually enjoyed both films, although the former was the better produced. Davis and Crawford both turn in good performances, too. Overall, I would say Strait-Jacket cashes in its camp quotient more than Dead Ringer, but that's where Crawford usually excelled. And, yes, the dog attack scene was a tad laughable, wasn't it? Crawford did seem more willing to change with the times than Davis. While Davis is generally regarded as the Actress and Crawford as the flashy Movie Star, I would side with the theory that Crawford was the greater Star overall. Both had substantial talent that kept their audiences wanting more. I tried to find something that showed Crawford's "phases" a little better, but this is the best I could get my hands on at such a short notice. STRAIT-JACKET should have had so much to offer, yet even Castle's HOMICIDAL and I SAW WHAT YOU DID (also with Crawford) were more polished productions. But STRAIT-JACKET was like some college play broadcast on a local cable access channel (if such a thing existed in 1963). Here we have the most promise for a horror film almost ever. 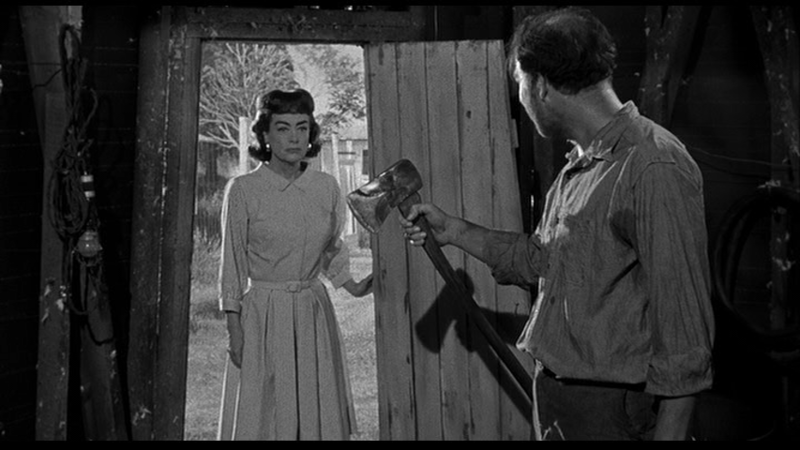 You've got Joan Crawford, with an axe, in the era in which it was the easiest to do creepy ever -- the early-'60s. And yet Castle, who'd reportedly hoped to make his "masterpiece" with STRAIT-JACKET, just phoned it in, seemingly disinterested in the project (although I'm sure he wasn't). No subjective camera view during the prologue murders?? The editing is clunky, the camerawork (by Doris Day's cinematographer, blurry-yet-unflattering close-ups included) and the flat-lighting, the period TV sitcom music score (okay, I actually like that -- you feel like Joan is slicing people up down the street from Hooterville, and that's kind of cozy), the scene ending dialogue which just sort of ..... stops ..... for no reason. Yes, Crawford's great, and the Fields' party near the end is a scream, but this is one of those movies I adjust in my head each time I watch it... to the point I'm compelled to fix it digitally, if I weren't so technologically hopeless. If only Castle had held out for cameraman Joe Biroc (who would later film Joan in HUSH... HUSH, SWEET CHARLOTTE and I SAW WHAT YOU DID) to give STRAIT-JACKET some badly-needed dignity. But Biroc was busy shooting VIVA LAS VEGAS and Crawford was probably convinced that Arthur Arling would make her look like the professional virgin Doris was. So much possibility. It just makes me want to kill somebody. On paper, the storyline for Strait-Jacket would certainly be more interesting, or in my head, anyhow. Being the fan of Crawford that I am, I always tend to root for her over others. (I would have preferred Crawford toughing it out for Hush, Hush... Sweet Charlotte.) In saying that, and while Strait-Jacket did intrigue me, it ultimately left me unfulfilled. The production seemed weak, cheap, and rushed; and despite all the hype it got, only Crawford and Diane Baker's performances were good enough to write home about. Nothing else really stood out. As for I Saw What You Did, Crawford's other Castle production, I have it on DVD. Evidently, what ever success the partnership got out of Strait-Jacket was enough for them to want to give it another go the following year. 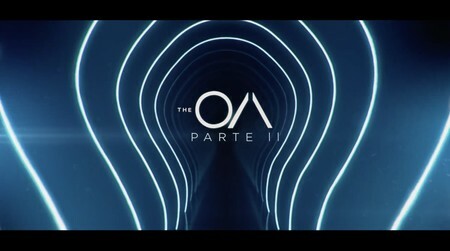 The overall production (i.e. lighting, camera work, music, etc.) is better, while the story and the performances are substandard. Crawford's role is marginalized, and while the story certainly sounds vaguely interesting on paper (or the back of a DVD cover, for that matter), it doesn't come off too appealing when filmed. I've only watched it once, and I must say that I'm certainly not bursting at the bits to give it another look. As popular as the Grande Dame Guignol genre was following the success of What Ever Happened to Baby Jane?, most of the follow-ups usually didn't live up to the hype that proceeded them. Crawford, Davis, and a handful of others (like Olivia de Havilland) could have found a stronger return to the screen had the scripts they been coaxed into --- "hag horror" or not --- been stronger during this time. But as struggling and aging actresses, they quite simply took what they were offered. Crawford dove quickly into the "schlock", which left the door open for de Havilland to fill her shoes, while Davis continued rather successfully during her post-Jane Hudson days, although the films themselves weren't necessarily to her previously-held standards. I would've hated to have missed CHARLOTTE or THE NANNY, but most of the others weren't terribly good. (THE NIGHT WALKER with Stanwyck has an effective prologue clearly not directed by William Castle himself). Although I always want one more from Joan than what she gave us -- one where she, too, plays twins -- in lurid halloweeny color, around 1966. Smells like Hammer. I don't know why. I guess NIGHT GALLERY has to suffice. Certainly, there were some good films in the genre that followed What Ever Happened to Baby Jane?, but the majority of them, from what I gather, were not as good as hoped. Yes! 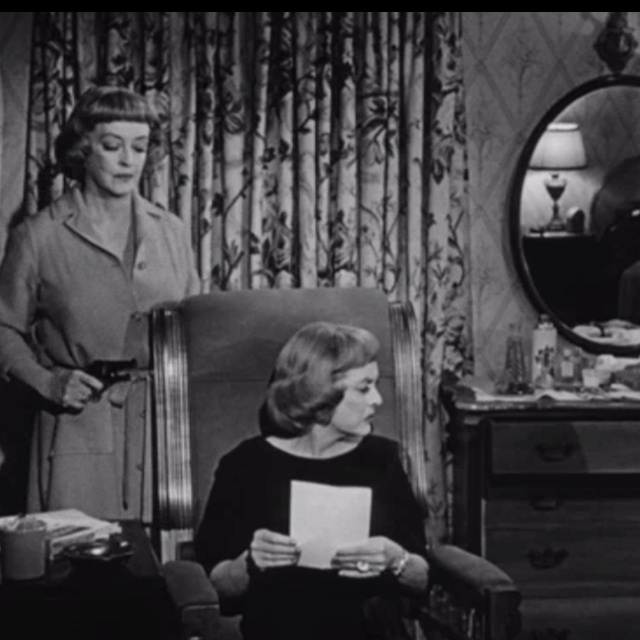 I would have loved a film around the 1966 period where Crawford plays twins; naturally, a good a bad sister. What would be the story though? Any ideas?